Nick Levey, Maximalism in Contemporary Literature: The Uses of Detail. New York: Routledge, 2016. While most scholars are familiar with minimalism as a dominant mode of writing in the postwar United States, maximalism remains an underexamined term in literary studies. 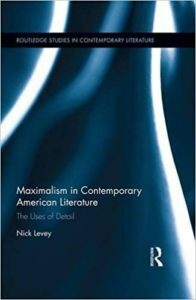 In Maximalism in Contemporary American Literature: The Uses of Detail, Nick Levey endeavors to provide a nuanced corrective to this lack of attention. Levey starts out by acknowledging the work of scholars such as Stefano Ercolino, Edward Mendelson, and Franco Moretti, who have examined large-scale literary works (“encyclopedic narratives,” as Mendelson calls them), but puts forth a different approach to the maximalist novel. Maximalism is best understood, Levey suggests, not as a genre determined by its length, but, borrowing a phrase from Arthur Salzman, as a “mode of inquiry” (6). That is, maximalism always involves an inquiry into the limits of representation: how representation is enhanced but ultimately challenged by its own excess. Levey’s goal is to examine the different provocations to, but also endorsements of, reading practices that stylistically divergent maximalisms entail. Levey provides an early definition of maximalism as “writing that values the pursuit of detail, specificity and comprehensiveness above other functions novels might be thought to have” (2). Such writing is, in contrast to commonly held notions about realist description, not mimetic; Levey writes that “it is not what is being represented that counts in the maximalist text, so much as the activity of representing” (3, emphasis in original). It follows that maximalism asks questions about the value and effects of writing in the contemporary period—from the 1970s to the present—questions which, Levey suggests, are intertwined with readers’ self-interrogation about how and why they read. Whether a text is short or long is indifferent to this project; what counts for Levey is “the transgression of what is usually considered the acceptable amount of detail… as well as challenging what kinds of details are considered to be of novelistic interest” (5, emphasis in original). Throughout the book, Levey investigates different uses of detail that redefine but also reinvigorate the abilities, functions, and values of writing and reading. Maximalism in Contemporary Literature examines two novels by Thomas Pynchon (Gravity’s Rainbow, Inherent Vice), David Foster Wallace (Infinite Jest, The Pale King) and Nicholson Baker (The Mezzanine, Room Temperature). Levey’s selection is, as he makes abundantly clear, not representative of the canon of maximalism. He justifies his exclusive focus on commercially successful and canonized white male writers by his interest in the fact that readers tend to find these novels’ uses of detail intriguing rather than off-putting. Certainly, the prolixity of Gravity’s Rainbow and Infinite Jest are central to readers’ intellectual admiration of these novels, although I wonder whether Baker’s two novels under examination here, The Mezzanine and Room Temperature, have received similar appraisals. Nevertheless, Levey’s inclusion of these short Baker novels allows for a very different valuation of the provocations of detailed writing: the stubborn focus on a small and trivial object can also produce important questions about the functions of representation, though a quite different set of questions than those prompted by the endless enumerations of tax codes in The Pale King, for example. While Levey has assembled a useful set of novels, the narrowness of his objects of study limit the potential of the book’s arguments. The first chapter provides an in-depth engagement with Gravity’s Rainbow, arguing that Pynchon’s novel stages feelings of readerly insufficiency by way of parades of authorial mastery and polymath brilliance. In a reading driven by consistent and at times predictable reversals, Levey argues that the sense of the implied author’s mastery both destabilizes readers’ awareness of their own abilities and provides reassurance in the knowledge of the author’s genius. Paradoxically, the paranoid feeling of “everything is connected” (43) that Gravity’s Rainbow offers not only worries but also comforts the reader: if there is a God-like author(ity) figure who connects the novel’s innumerable details, and that figure is, after all, only a human being, then this counteracts the reader’s own sense of helplessness in the face of the technological sublime. This authorial performance of human ability, Levey argues, ultimately empowers the reader too. In an age in which technology increasingly displaces human labor and human achievement, the maximalist novel stages the acts of writing and reading in immense detail as comforting demonstrations of continued human significance. Although it is not always clear what model of reader reception is operative here (might readers, for example, value Gravity’s Rainbow not so much because of what it does but rather because it has been held up in the classroom as an example of postmodern literature par excellence? ), as a formalist reading of the effects of maximalism, this chapter is provocative and convincing. The two chapters on David Foster Wallace shift gears to a somewhat different line of inquiry. Levey argues that Infinite Jest and The Pale King ask readers to reassess their valuations of what is considered important information and what is useless or boring detail in prose writing. Drawing on Roland Barthes’s distinction between the cardinal points and the catalyses, or fillers, of narratives, Levey suggests that Wallace’s novels question the hierarchical relationship between cardinal points and catalyses, interrogating what it means to read with a view to the traditionally neglected, boring or insignificant. Infinite Jest, Levey proposes, not only attempts to restore a genuine relationship between author and reader (as scholars have previously argued), but also repeatedly “flunk[s]” (60) that relationship. By staging failures and by stubbornly refusing to be interested in what should be cardinal points in the development of the narrative, Infinite Jest shifts our attention to the significance of catalyses in meaningful intersubjective relationships. With some caution, Levey suggests that this tension at the heart of Wallace’s novel reflects the situation of the writer vis-à-vis expanding information technology: should the writer work to recuperate genuine relationships from capitalism’s grasp? Or do endless details merely participate in capitalism’s dissemination of disinformation? Levey’s reading of The Pale King is less ambiguous; he suggests that in the information age, a boring novel is a mechanism for survival for readers, who can use it to train themselves in the interpretation and appreciation of boring detail, which, under capitalism, is considered useless but is actually paramount. The Pale King thus both trains readers for and allows readers to assess their valuations in a late capitalist information age. The most insightful parts of Levey’s book are the two chapters on Baker; Levey’s investigation of maximalism in Baker’s short texts is fresh and useful. While Gravity’s Rainbow operates with epistemological skepticism, The Mezzanine and Room Temperature embody what Levey calls “epistemological optimism” (100): though it may not be possible to comprehensively understand even a small object like a stapler, it is possible and highly worthwhile to devote copious attention to it. 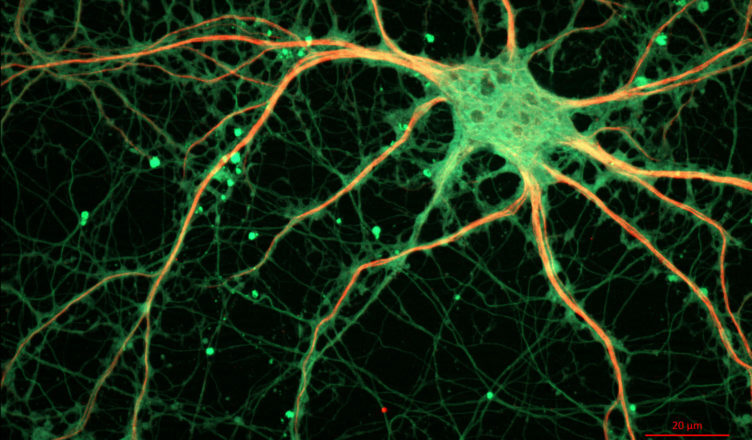 The Mezzanine looks with infinite interest on the most trivial, minute details of everyday experience, while Room Temperature delves into the limits of our ability to comprehend these details even as it insists on the continuing need to expand our perspectives of analysis and appreciation. Baker’s novels offer a model for investigating everyday objects and our relations to them productively, without merely dismissing them as commodities. This inquiry also allows us to recognize that humans are not just consumers of objects, but that they also use objects to negotiate pleasure, knowledge, and curiosity—however limited—outside of consumption. These investigations offer a “maximalist ethics,” what Levey describes as “a defense of the insufficiencies of human understanding and passion, recognizing the necessity of the junk as much as the giant and defending the full spectrum of cultural participants” (102). While illuminating as an account of different maximalist challenges to representation, Levey’s book leaves some important questions unanswered. Further analysis could, for example, productively interrogate how these maximalist challenges interact with postmodernism and its aftermath. The majority of the novels that Levey considers were published before or around the time that Fredric Jameson’s groundbreaking article on postmodernism appeared (1984),1 so the important studies about the contemporary as constituted by the wake of postmodernism—such as the special edition of Twentieth-Century Literature edited by Andrew Hoberek titled “After Postmodernism”2 or the critical introduction to Twenty-First-Century Fiction by Peter Boxall 3—could contextualize Levey’s discussion of contemporary reading and writing. It would likewise be worthwhile to extend the analytical purview to a more inclusive and global maximalist canon. Post-2000 novels such as Roberto Bolaño’s 2666, Péter Esterházy’s Harmonia Caelestis, Elena Ferrante’s Neapolitan Novels, and Karl Ove Knausgaard’s My Struggle invite further inquiry into the conversation between and across global literary networks than Levey’s cursory glance affords. Maximalism in Contemporary Literature offers a compelling account of what highly different uses of detail can accomplish. Detail and attention, rather than maximalism, turn out to be the most suggestive terms in Levey’s book; complex syntax or structure need not, after all, accompany minute attention to detail. Maximalism in Contemporary Literature is at its best when it offers, as it does with Baker’s novels, an interpretive framework that takes seriously our pleasurable engagements with the objects of everyday culture. While Levey’s exploration of reading strategies in the age of information overflow is useful, it is his consideration of the productive, “optimistic” relation of detail to consumer objects that provides the most novel contribution to literary scholarship. Maximalism in Contemporary American Literature is a helpful starting point for scholars interested in the divergent effects and uses of detail across novels both short and long. Fredric Jameson, “Postmodernism, or the Cultural Logic of Late Capitalism. New Left Review 146 (1984). Andrew Hoberek, “Introduction: After Postmodernism.” Twentieth Century Literature 53.3 (2007): 233–47. Peter Boxall, Twenty-First-Century Fiction: A Critical Introduction (Cambridge: Cambridge UP, 2013). Daniella Gáti is a fifth-year PhD student at the English Department of Brandeis University. Daniella focuses on postmodern and contemporary literature, popular culture, neoliberalism and 21st century realism. She has presented papers on the spatial practice of Wall Street yuppies in American Psycho, compulsive consumption in the oeuvre of pop musician Lana del Rey, and hipster reality hunger as manifested in beer consumption. 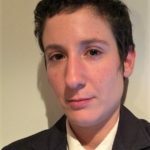 Daniella’s dissertation explores how a new strand of realism in the contemporary moment invests in the situations—the materially anchored social and physical spaces—of characters through brief, fragmentary forms as a way of mapping a reality whose totality exceeds representation. While completing her MA, Daniella published "Poems as Specters: Revenant Longing for Roots in Jean Toomer's Cane," aspeers 7 (2014): 17-39.